Depending on what you’re looking for, an RC helicopter can either be a good idea or a bad one. Of course, you have other options if you’re looking for a UAV nowadays – a drone, or quadcopter, being the most popular. There are a few reasons why you might prefer an RC to a drone however, and they do still have their place. 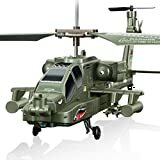 So, lets have a look at some of the best RC helicopters to choose, especially if you’re looking as a beginner and aren’t exactly sure as to what you want. 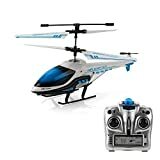 For people brand new to RC helicopters, the last thing that you want to do is spend $100 on a helicopter, only for you to crash it or never use it again. That’s why budget RC helicopters can give you a better idea of RC helicopters in general. They can help you to get to grips with the control, but also let you find out if you want to take the hobby any further. For such a cheap helicopter, the S107 is surprisingly resilient. This is because of the metal frame that the helicopter uses. If you’re purchasing this for a young one that might end up crashing a lot, this could be a safe choice. Or if you think you might end crashing a lot, then it might also be necessary too! In fairness to this helicopter, it isn’t going to blow you away with dazzling speed or the ability to do 360s. But, it definitely does all of the basics extremely well. You’ll get a flight duration of around 8-10 minutes, which is pretty decent considering it only has a 20 minute charge time to get it to full battery. You’ll need to pick up some good rechargeable batteries also (I use the same Panasonic Eneloops I use in my Xbox controller) as it takes 6 AA batteries. But realistically, if you’re on a tight budget then you’re going to struggle to find a better option than the S107. If appearance and aesthetics are important to you, then this VATOS RC might prove to be a good choice. It’s jet black, aside from the green strips and fluorescent pink lights. At nighttime, this makes it look pretty awesome. For most older and adults, this would prove to be a really fun helicopter to use. It’s soft propellers will immediately stop working upon impact, so if you crash, you don’t need to worry about damaging it too much. Its’s actually a surprisingly stable helicopter as well, meaning if you’re looking to use it in enclosed spaces, you can easily. This RC helicopter isn’t ideal for younger kids due to the controls, which can be difficult to use for under 12s. One thing to consider with this one is that it has a relatively short flying time of 6 minutes, which if you compare it to the price, might not make it worthwhile. Syma don’t just make super cheap RC helicopters – they also make higher quality ones, too. The S109 is a bulkier, better version of the S107 that’s laden in army colors. The good thing about the S109 is that it has a much increased battery life. Whilst the 107 will only last 8-10 minutes, you’re more likely to get 15 full minutes of flying out of the S109. Of course, the charge time is slightly longer too, but it’s not excessive. Like the S107 however, this is made from really durable material, meaning if you crash or have a heavy landing, you don’t need to be too concerned about permanent damage to your RC helicopter. One of the main worries with purchasing an RC helicopter is that it will crash and die after the first poor landing, so buying a durable RC helicopter is a must. The controls are really easy to use for beginners, and you won’t struggle with orientation due to the basic layout of the controller. 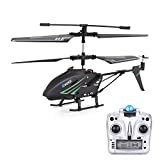 Another good option for a beginners RC helicopter. 【3.5 CHANNEL INFRARED CONTROL】: 15 meters range of infrared control, allows to fly Up / Down, Left / Right, Forward / Backward movements. The Built-in Gyro helps to stabilize the helicopter's heading. The S810 from Koowheel is extremely similar to the VATOS RC helicopter. And whilst it doesn’t look quite as cool in my opinion, it’s certainly a good RC helicopter for beginners and novices. It’s a simple to use RC helicopter – it should take about 30 seconds to connect from the controller to the helicopter itself. Another cool point about this RC helicopter is that it has a built -in diagnostics map on the controller. It isn’t too in depth, but it can be really fun for the kids to use. Like the other RC helicopters I’ve featured, it’s definitely going to hold up with falls and minor damage. So, you don’t need to worry about breaking the helicopter within your first flight. You’re going to get about 8 minutes of flight time after a 40 minute charge, which isn’t perfect, but certainly enough to have some great fun. I know this is a post about RC helicopters, but it’s worth mentioning drones too. Whilst typical ‘helicopters’ only use one rotor, drones (what we call drones.. the term drones actually refers to anything aerial) will typically use four rotors, which makes them a quadcopter. Drones are worth considering for a couple of reasons. Personally, I prefer RC helicopters for having fun with, but quadcopters have a practical use as you can use them for aerial photography. However, for ease of use, I do think that drones are actually a lot easier to use than an RC. This is mainly because drones have headless mode, which means that you can control the drone dependant on what direction you are facing, not the drone itself. RC helicopters can be hard to control, especially for younger kids. Anyway, this is an option if you’re going to consider a decent drone with a camera. It’s durable, and unlike with most RC helicopters, you get altitude hold. This allows you to easily hover at the same level for an extended period of time, which can be useful if you struggle maintain airtime. Whilst you might prefer a typical RC helicopter, quadcopters can provide a decent alternative. If you’re going to purchase an RC helicopter, there are some things that you’re going to want to consider beforehand. This can help you to ensure that you get a good helicopter that suits your needs. Fortunately, the majority of RC helicopters are made with durability in mind. Companies expect you to have a few crashes at some point down the line, so they’re often made from good materials that aren’t going to break easily. You’ll also want to consider the blades of your copter too. Some blades are made from hard materials, whilst others use softer materials that are likely to deal with impact better. The price of your helicopter is another important thing that you’ll want to take into account. Undoubtedly, you want to get an RC helicopter that’s of a decent quality. But, you’d be mistaken in thinking that for decent quality, you have to go out and spend a fortune on a RC helicopter. This isn’t the case. For beginners or kids, a cheap RC helicopter will definitely do the trick. Why? Well, if you do get any bumps or worse case scenario, you lose your RC helicopter, it isn’t the end of the world. Plus, all RC helicopters use the same general controls and orientation. So, a cheap RC helicopter can be a good way to practice before you level up to something bigger and better. 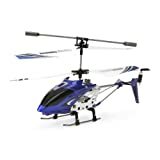 RC helicopter come in a wide variety of different styles. By styles, I’m referring to colors but more importantly, sizes. The majority of RC helicopters won’t be suitable for indoor use, but there are smaller RC helicopters that are suitable for this. The majority of RC helicopters are about 8 inches in length, which is probably too big for using them indoors. So, it’s definitely worth ensuring that you get the right size helicopter for your needs. A decent beginners RC helicopter has to fit all the right criteria. Easy to control, affordable and the ability to take all the bad landings and heavy crashes that any newbie is guaranteed to come across! If you combine all of these characteristics, then you’ll get the perfect RC helicopter. Although RC helicopters can take a little time to get the hang of them, they’re an extremely fun toy and hobby to get in to. They’re one of the best toys out there, so they’re worth considering if you’re looking for a Christmas present.